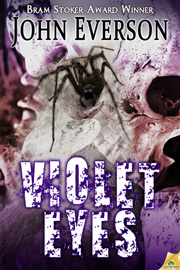 The spiders are loose... VIOLET EYES hit bookstores this week! VIOLET EYES is in bookstores this week. Get your creepy spiders for Halloween now! "Look, he's crawling up my wall, black and hairy, very small. Now he's up above my head, hanging by a little thread" - The Who "Boris The Spider"
Violet Eyes hit bookstores on October 1! This is my big “spider” book, and I’m really excited about the release. It’s been a long time coming -- I first outlined the novel five years ago. I hope you'll pick up a copy and help spread the word about its release! That’s when the spiders came. Spiders that could spin a deadly web large enough to engulf an entire house overnight. Spiders that left stripped bones behind as they multiplied. Spiders that, like the flies, sought hungrily for tender flesh…through Violet Eyes. TO CELEBRATE (and pave the way for the novel), the e-novelette “prequel,” Violet Lagoon is also on sale this week for just 99 cents! When I originally outlined the novel Violet Eyes back in 2008, my editor loved the concept, but was concerned about releasing the book right after another series of spider-related novels had come out… so he said to wait on diving into that novel awhile. While I waited to write the full book, I decided to go ahead and write up the outlined prologue as a standalone story for Creeptych, a short collection I did with Delirium. 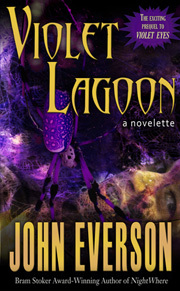 That novelette is Violet Lagoon, which now is available under its own cover. In the end, when I finally wrote Violet Eyes, the novelette ended up being too long to serve in its entirety as the novel’s prologue, but much of Violet Lagoon does appear in Violet Eyes — in part as the prologue and in flashbacks throughout the novel. I thought some people would still want to read Violet Lagoon, the original, uncut novelette, the way it originally was published. Hoping everyone enjoys the creepy crawlies of Violet Lagoon and Violet Eyes! LAST MONTH, I had a blast hanging out with my fellow Samhain authors (Jonathan Janz, Russell R. James, Kristopher Rufty, Mick Ridgewell, Brian Moreland and David Searls) at the HorrorHound convention in Indianapolis. 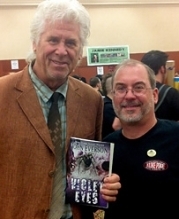 I also had the chance to talk with Barry Bostwick (pictured at right - click the photo to see a larger version) and Danielle Harris (from the Halloween movies). I also met a bunch of horror fans at the con, some of whom are now on this e-newsletter list (Hi guys!) You can see more about the con and a bunch of pictures on my blog here. This month, I'll be celebrating Halloween with authors W.D. Gagliani, Christian Larsen and more at the Barnes & Noble in Racine, WI. The "Horrorfest" will run all afternoon. See info on the B&N Southland Center site. A week later, on Sunday night, I'll be the guest author at the WritersChatroom.com. Everyone is welcome to drop in and chat, so stop by! THEY ARE ALL my novels, sure! But they are also on sale this month on Amazon.com and Amazon.co.uk. Amazon.com has Covenant, Sacrifice, The 13th and Siren for sale for just $0.99 in e-book. I have no idea how long they're staying that way, so download fast. 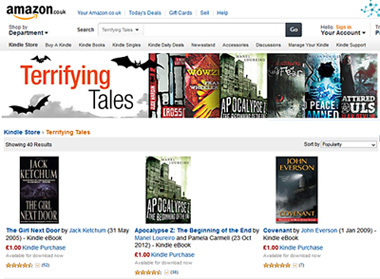 Meanwhile, Amazon.co.uk has put Covenant, Sacrifice and The 13th on their "Terrifying Tales" promotion for £1.00 Thanks to the UK sale, Covenant has been in the Top 5 Horror sellers in the UK all weekend! So pick these up cheap for your e-reader, if you don't have copies already! Hardcover edition of NightWhere will be out around Halloween! IT'S BEEN IN the works for awhile, but Bad Moon Books will finally be releasing a limited 100-copy special signed hardcover edition of my sixth novel NightWhere at the end of the month. I'll be in contact with anyone who ordered a copy directly through me in a couple weeks to get payment, mailing address, etc. If you haven't ordered a copy and want to grab one from Bad Moon, check out this link now. I believe there are still a few numbered copies available to order. Cage of Bones reissued in trade paperback! I HAVE ALWAYS felt bad that Cage of Bones & Other Deadly Obsessions never came out in a paperback version when it was originally released. 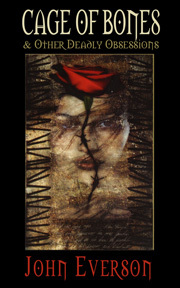 It was my very first book, and appeared in a limited hardcover edition back in 2000 from Delirium Books. At one point, since there were only 300 copies made, there were some copies that were resold on eBay for $150! Eventually, the collection did get a stripped down e-book release from the publisher, but that version was missing content from the original hardcover. October is a favorite time of year for all horror fans. Time to celebrate the spooky! If you're looking for some free fiction or some creepy fun, stop by my micro site for the Pumpkin Man novel and read the prologue of that book, or the original story that inspired the novel, or my perennial favorite "Pumpkin Head." All of those stories are free on www.thepumpkinman-horror.com. 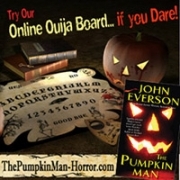 Visit The Pumpkin Man website and play the Ouija Board!